Among the data that the General Election Commission has made available quickly is the breakdown by Aimag and Ulaanbaatar ridings. It’s quite clear from a glance that Elbegdorj has won this election on the strength of his showing in the capital, but there are other patterns in the regional distribution as well. Let’s first look at Udval’s result for the election. With just over 80,000 voters, Udval received 6.5% of the votes nationwide. Udval received the most votes in Arkhangai (12.98%), Bulgan (10.29%), and Selenge (9.79%). This shows a bit of a regional concentration in that these are neighbouring aimags to the West and North of Ulaanbaatar. She received the least votes Khentii (2.55%), the Bagakhangai district of Ulaanbaatar (3.02%), and Zavkhan (3.04%). Noticeable among these is Khentii, Bat-Erdene’s home province where he did extremely well. This relationship suggests that Udval and Bat-Erdene split votes in many jurisdictions. Bat-Erdene received by far the greatest share of the vote in his home province of Khentii with 62.5%. In the home province race, he thus beat Elbegdorj for whom 61.17% of his fellow Khovd-ians voted. 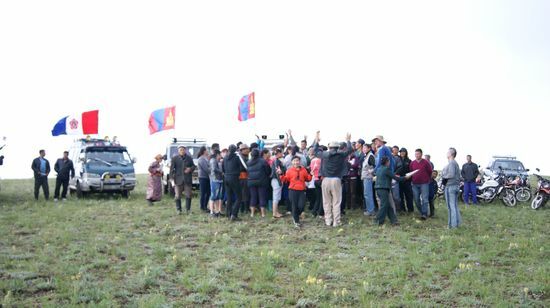 Surely the MPP supporters in Bat-Erdene’s hometown of Omnodergel – shown here at their final rally on Monday evening on a hill overlooking their broad valley – were among those Khentii voters supporting Bat-Erdene. After Khentii, Bat-Erdene’s highest vote shares were from Sukhbaatar aimag (54.49%), and from Dundgobi (53.81%). Note that Bat-Erdene received high shares of votes all across the Gobi desert, that is across the South of the country. Hey, I made a map based on the elections results here. Though it might interest you.